The new DermLite DL3N is now even more capable than ever. With refined optics and improved visualization of both pigmented and vascular structures, it is the tool of choice of the world’s leading dermatologists. Precision-engineered and crafted from recyclable aluminum, it features a 25 mm four-element lens, 28 high-powered LEDs and the all-new PigmentBoost™ illumination. 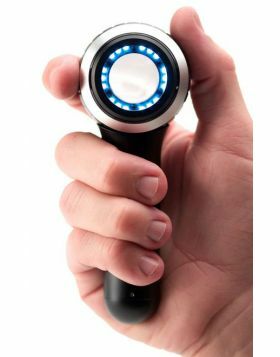 For optimum ease of use, a quick tap on its power button instantly toggles between polarization modes while the optional PigmentBoost mode produces a warmer illumination reminiscent of conventional dermatoscopes. 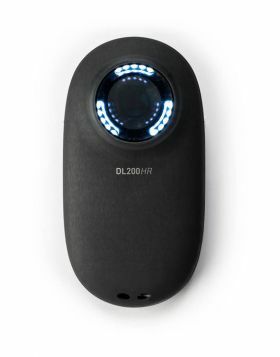 The convenient DermLite DL3N retractable faceplate spacer design and focusing mechanism enables you to quickly switch between non-contact and skin contact modalities and lets you precisely focus your image while in skin contact. The spacer comes with a glass faceplate with 10 mm markings and, due to its fully enclosed design, contaminants as well as undesirable ambient lighting no longer affect your image. 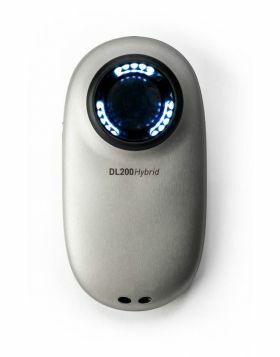 To reduce reflections and may greatly improve the contrast of the image, an optional eyepiece is included. With the new DermLite DL3N, it’s easy to create your very own digital dermoscopy system by attaching one of many compatible cameras or camera-equipped mobile devices. Simply attach your digital camera, smartphone or iPad, extend the spacer, and start taking sharp, glare-free images quickly and easily. This state-of-the-art device will let you know when it’s time to recharge its long-lasting lithium battery: Once the charge level drops below 25%, the “3” on the top of device changes from green to orange. 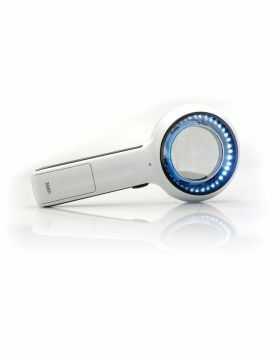 The new DermLite DL3N packs the unique advantages of both polarized and non-polarized dermoscopy with or without immersion fluids, improved vascular imaging, color temperature selection with PigmentBoost, great optics, solid durability, refined ergonomics and amazing versatility into a beautifully elegant design.